Late-stage dementia is characterised by increasing agitation that can be distressing for the person with the illness and their carers. So, researchers are investigating whether robots disguised as animals might be able to help reduce some of these difficult behaviours. As their dementia progresses, people can become upset and pace or talk constantly, repeating meaningless words. Robotic animals may be able to help calm them by being engaging, giving them a sense of purpose and providing opportunities to communicate their feelings. Animals have been used to help people with psychiatric problems or disabilities since the 1700s when people with mental disorders were encouraged to care for animals such as birds and rabbits as part of their therapy. More recently, having dogs visit people in nursing homes has been shown to decrease levels of agitation and increase social behaviour. Indeed, a review of the small number of research studies on the subject found animal-based therapies have a positive effect on communication and coping ability. But having animals visit nursing homes has a number of drawbacks. Animals can be unpredictable, people may have allergies to them, they can be expensive and caring for them may be time-consuming. To address some of these problems, researchers in Japan have designed a robotic baby seal, called Paro. This alternative to a real animal provides the benefits of animal therapy in places such as nursing homes and hospitals. Paro has sensors that detect touch, light, sound and temperature, and is able to use this information to respond to people by fluttering its eyelashes or waving its tail and flippers. The robots cost around A$5,000 each and can express emotions such as surprise, happiness, and anger. They can also learn to respond to their own name. 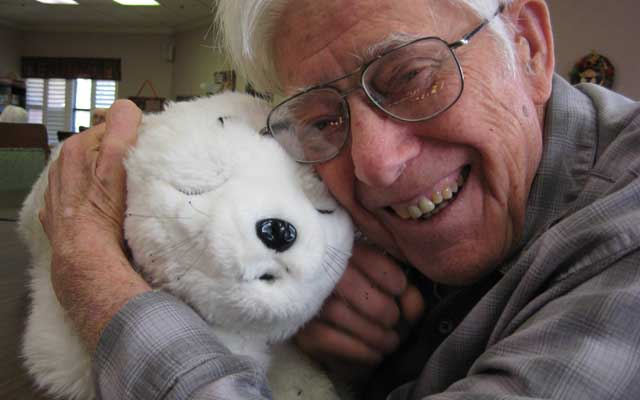 Early studies have found that, just like animal therapy, the introduction of robotic animals can improve quality of life and mood in people with dementia. But there are outstanding issues with using robots as therapy for dementia patients. For starters, there’s still little evidence supporting their use. Studies often include only a few people, and benefits are based on researcher observations rather than being measured systematically. Japanese researchers have created this robotic seal called Paro. And robot therapy may not be appropriate for all kinds of dementia. Researchers have only been studying how social functioning and emotions are affected in people with dementia for a few years. What has become clear in that time is the extent to which someone’s ability to understand and feel emotions is affected is dependent on the type of dementia suffered, and the regions of the brain impacted. The most common type of dementia is Alzheimer’s disease. In its early stages, people experience problems with their memories, with knowing what date it is and finding their way around. But as brain shrinkage becomes more widespread, emotional functioning may be affected, and behavioural changes such as agitation become more common. In contrast, in people with frontotemporal dementia, the earliest problems are changes in personality and behavioural functioning. Research I have done with some colleagues shows people with this kind of dementia have severe problems in understanding how other people feel. This can make social interaction particularly challenging, even in the very early stages of the disease. Because the symptoms of these two types of dementia are so different, using robots as therapy might not be equally beneficial for everyone. We know that people with frontotemporal dementia, for instance, have trouble distinguishing between emotions such as anger and sadness. These people might find interactions with Paro confusing rather than comforting. It’s also not clear whether robot-based therapy could improve cognition or thinking ability in people with dementia, and whether these types of interventions could change the way the brain functions. Clearly, there’s still a long way to go in finding effective treatments for dementia. In the meantime, interventions that address some of the behavioural and social changes in people suffering dementia are of great importance.